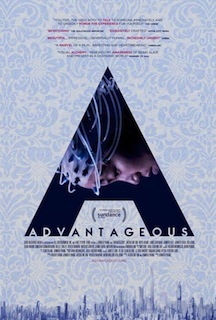 Movie Review: Set in a near future where economic power keeps strangling the chances of happy lives, “Advantageous” tells the story of Gwen (Jacqueline Kim) who opts to sacrifice everything she had built for the sake of her talented 12-year-old daughter, Jules (Samantha Kim). Gwen is an independent single mother who has been the face of a cosmetics company during most of her life. Bad news arrives in many ways: first she acknowledges that her daughter, despite the high intellectual capabilities demonstrated, wasn’t accepted in Arcadia school. Instead, she’s going to Eastern school whose tuition is double. Simultaneously, the company’s chief, Dave Fisher (James Urbaniak), informs her that her contract won’t be renewed and that they’re already looking for a younger candidate to replace her. Deeply concerned with her daughter’s future, a few difficult options will come to Gwen’s mind: call her estranged mother and ask for money; expose the situation to Jules’ father, confronting him for the first time and triggering a family crisis since he’s married to her cousin Lily; and the toughest one, requires her to make permanent changes by adapting her mind into a younger body, a tech operation that also demands enduring pain, take a shot every two hours for a year, and being reminded about everything that’s important. Directed with an advantageous sobriety by Jennifer Phang, this slight sci-fi flows at a consistent pace, impelling us to be supportive with the dedicated mom. The camera moves with confidence and objectivity, pulling out images with a tasteful sense of aesthetics, in a mix of real world, as we know it, and an understated imagined future that conveys mystery at every shot. Mrs. Phang’s approach is comfortable and exquisitely sophisticated while Jacqueline Kim is superb as Gwen, displaying sadness and inner anxiety while weighing the pros and cons of a step that has no turning back.